Preheat oven to 180°C (350°F) and grease whatever 18-20cm round cake tins you have (I only had one so I had to bake each cake one after the other). Line the base of tins with baking paper and grease paper and dust tins with flour. Combine flour, baking powder and salt in a medium bowl and set aside. Mix milk and vanilla together in a measuring jug. Using an electric mixer on low speed, beat sugar and butter in a large bowl until blended. Increase speed to high and beat for 2 mins or until pale and creamy. Reduce speed to medium low, add eggs 1 at a time, beating well after each addition. Alternately add flour mix and milk mixture, beginning and ending with flour mixture (I did it by adding 1/4 of of the dry mixture followed by 1/3 of the wet mixture at a time). Beat until smooth, occasionaly scraping bowl with a spatula. Divide mixture evenly into 5 medium bowls (I did this by measure the batter, it ended up being about 300g per bowl for me). Leave one bowl of batter white, then very gradually add colouring to each bowl and gently fold it into the mixture, adding slightly more colouring as you do each bowl so that the 5 bowls give you a even gradient of colour. Pour batter into prepared tins and bake each layer for about 15-20 minutes or until a skewer into the centre comes out clean and the outside is golden. Cool in tin for 5 mins and then turn out onto wire racks to cool completely. Prepare the icing; remove butter from fridge 30 mins before starting and chop into small cubes. In a large mixing bowl, beat butter on high with an electric mixer until smooth and fluffy. Reduce speed to medium-low and gradually add icing sugar until combined, then increase speed to high and beat until pale and fluffy. While still mixing, gradually add any extra table salt to taste if needed. Prepare cake for icing, you may need to trim the tops a bit to make sure they are level. 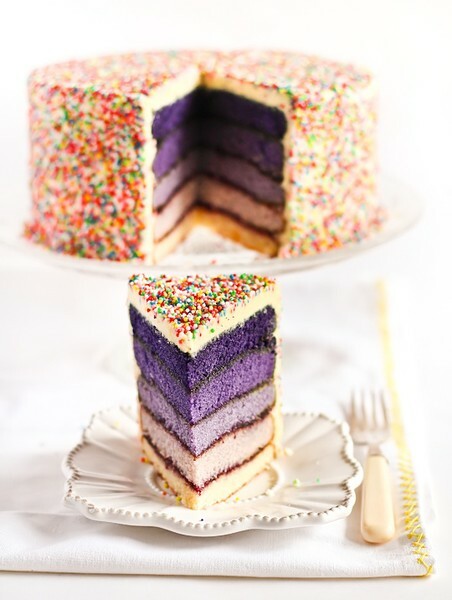 Layer cakes with jam (or more icing). Crumb coat the cake with some of the prepared icing and chill for 15 mins. Cover the cake with more icing, smoothing out with a spatula (I use an offset spatula that I keep clean and warm by running under hot water to get it smoother). If decorating with sprinkles, it can get pretty messy so place your cake in a large container that will catch any of the sprinkles that will run off the cake as you try to stick them on the sides of the cake. Serve cake at room temperature, store cake in the fridge in an airtight container.